May average temperatures were generally below normal in southern areas and above normal in northern areas. Much of the Northeast saw below-normal temperatures during the first half of May, then a warm up towards the end of the month. On May 28, temperatures in the upper 80s and low 90s ranked among the top 5 warmest on record for May at a few sites. With a low of 67°F on May 29 and 31, Bridgeport, CT tied its record for warmest low temperature for the month. 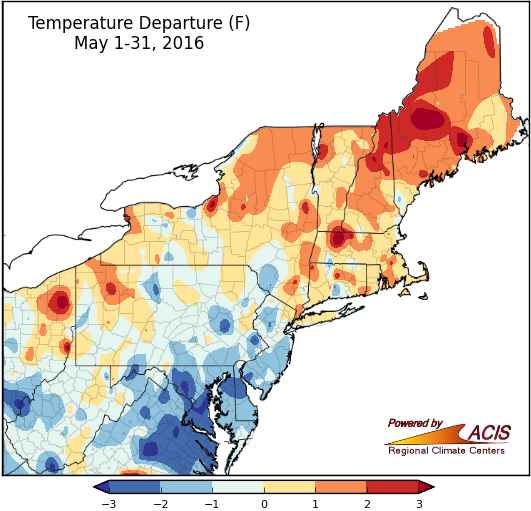 When May wrapped up, average temperatures ranged from more than 3°F below normal in parts of Maryland to more than 3°F above normal in parts of northern New England. Twenty-two of the region’s 35 major climate sites were warmer than normal in May. The spring season ended on the warm side of normal for almost the entire region. Average temperatures ranged from 1°F below normal in northern Maine to more than 3°F above normal in parts of Pennsylvania and West Virginia. All but one of the major climate sites was warmer than normal, with 29 sites ranking it among their top 20 warmest springs. 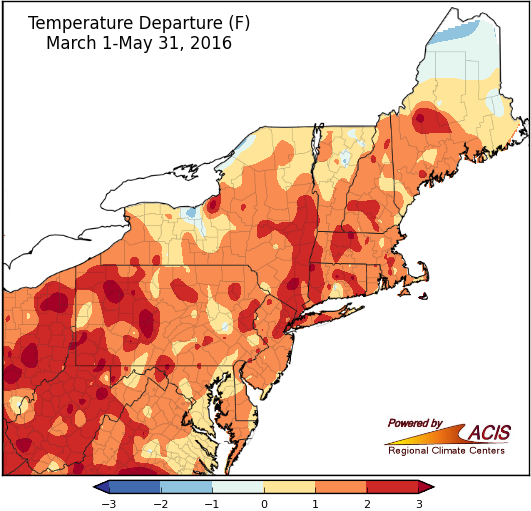 Spring temperatures were 1°F to 3°F above normal at many of the major climate sites. May precipitation was generally below normal in northern areas and above normal in southern areas. 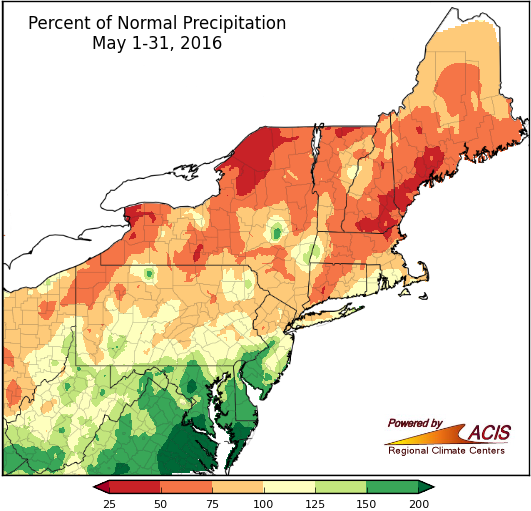 May precipitation ranged from 25% of normal in parts of New York and New England to more than 200% of normal in parts of Maryland. The main storm track stalled over southern parts of the region during the first half of the month, bringing above-normal precipitation and contributing to below-normal temperatures. Of the 35 major climate sites, 22 were drier than normal during May. 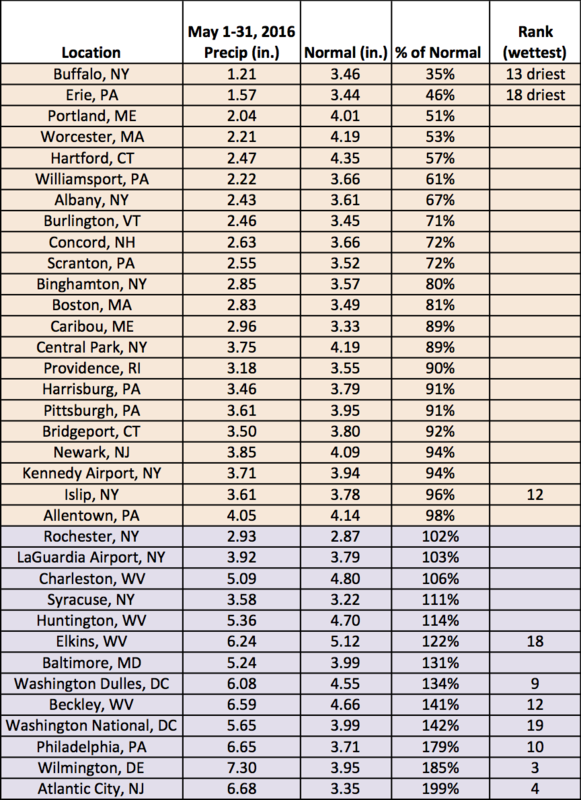 On the 29th, Syracuse, NY picked up 2.42 inches of rain, making it the site’s greatest 1-day rainfall for May. 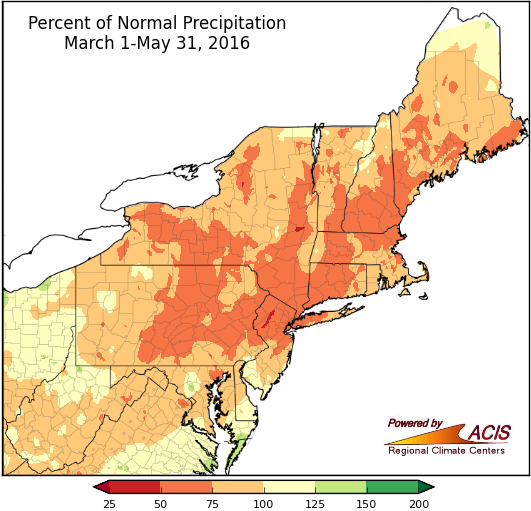 Spring precipitation ranged from 50% of normal to 125% of normal. The lack of precipitation contributed to abnormal dryness and moderate drought in parts of the region. Thirty of the major climate sites were drier than normal. Of those, 14 ranked the season among their top 20 driest, with two being record dry. 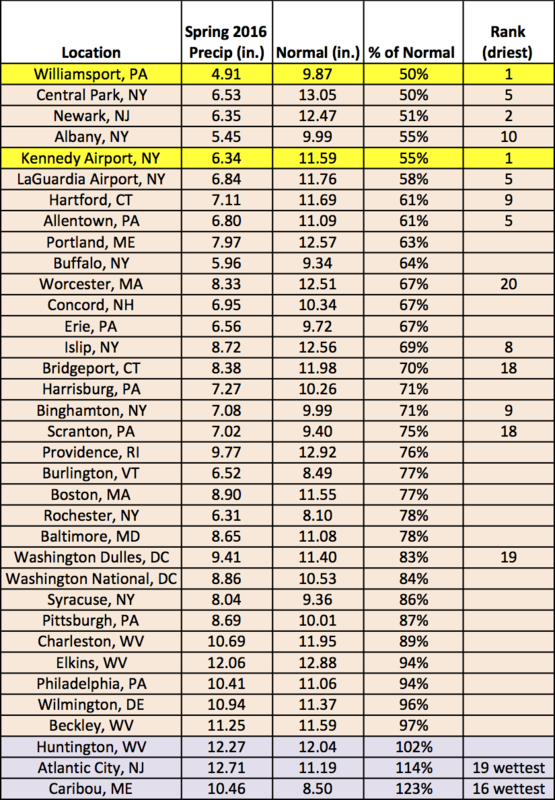 Williamsport, PA and Kennedy Airport, NY had their driest springs on record. 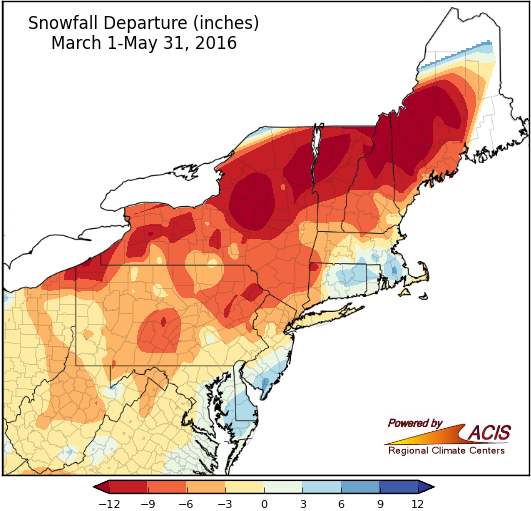 Spring snowfall was below normal for a majority of the region. 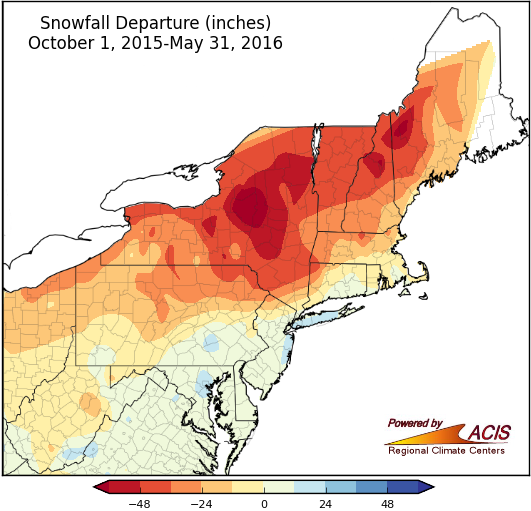 While May is generally not a snowy month, seven major climate sites normally receive between 0.1" and 0.5" of snow. This year, only Caribou saw measurable snow (0.1"). The site had its 4th snowiest May with 4.8" and had its largest snowfall (4.5") so late in the season on May 16. For the spring season, snowfall ranged from more than 12" below normal in parts of New York and northern New England to 9" above normal in northern Maine. 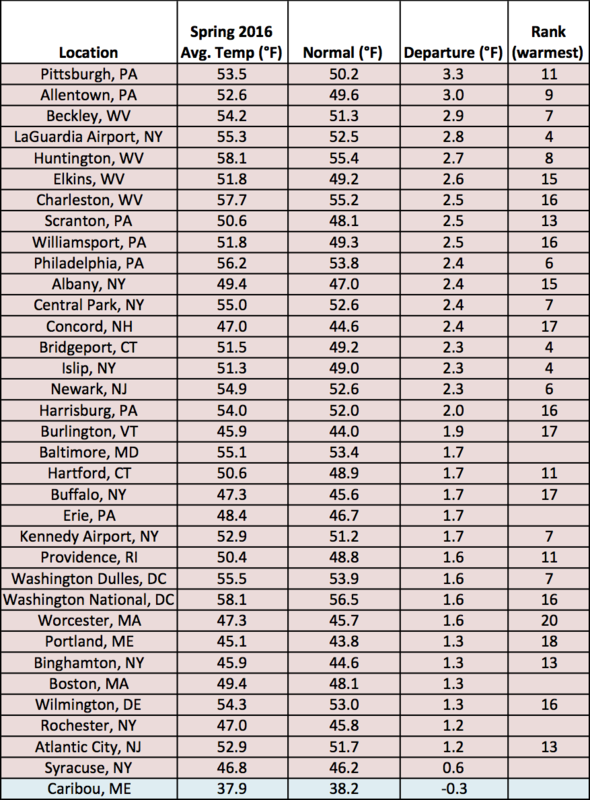 Twenty-seven major climate sites saw below-normal spring snowfall. 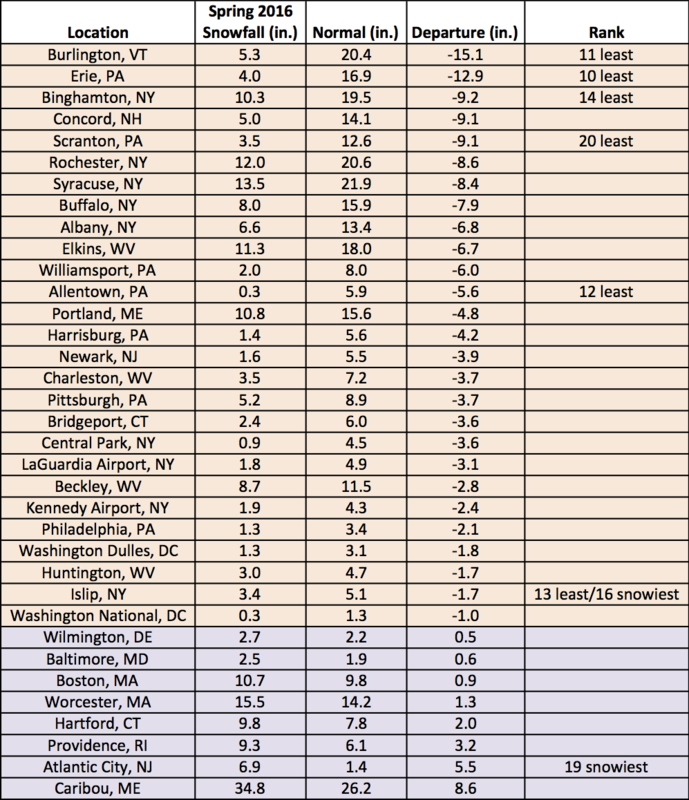 Totals for the snow season (October 1-May 31) ranged from more than 6 feet below normal in parts of New York and New England to 2 feet above normal in a few spots from southern West Virginia to Long Island. 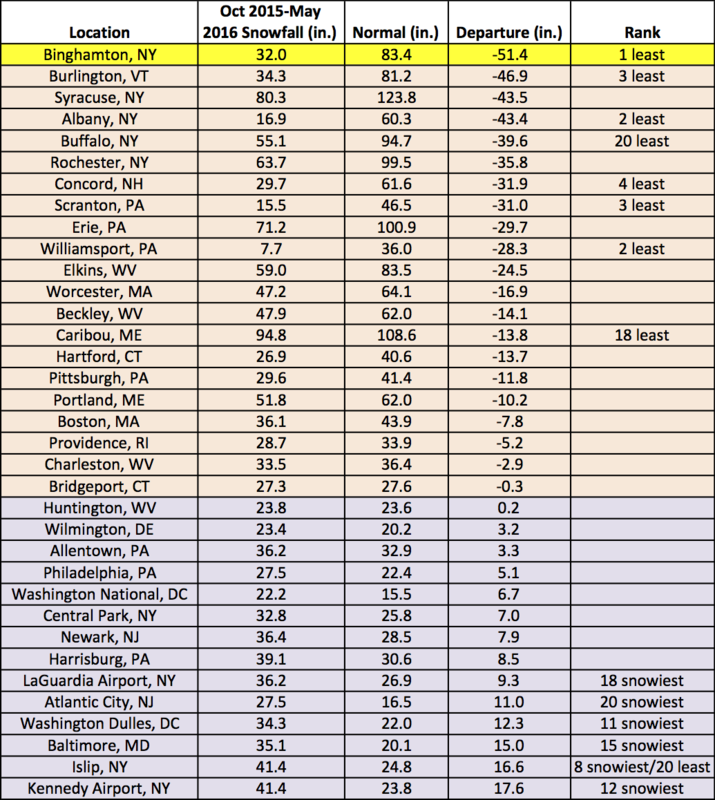 Twenty-one sites saw below-normal seasonal snow, with Binghamton, NY having its least snowy season on record. 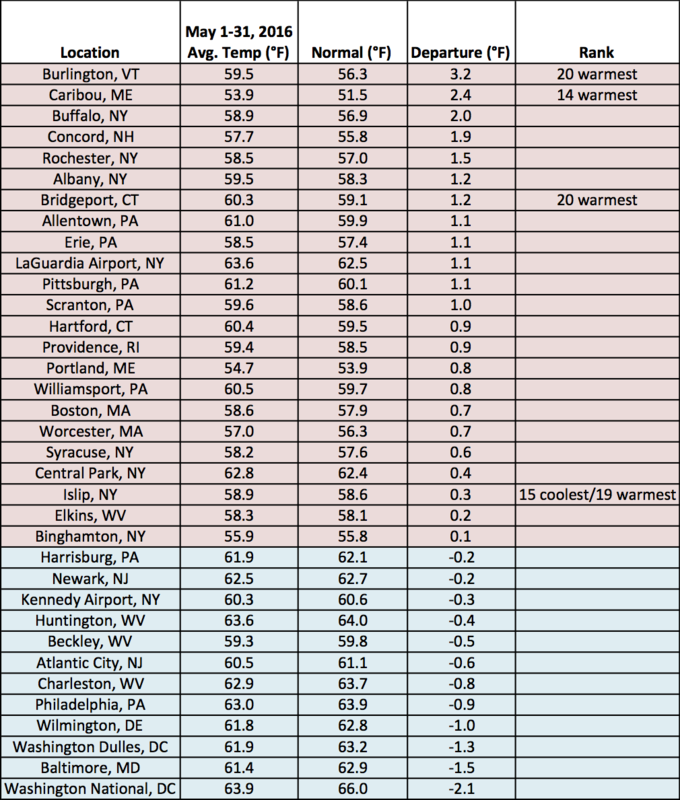 Binghamton, NY saw record-low snowfall for the season.